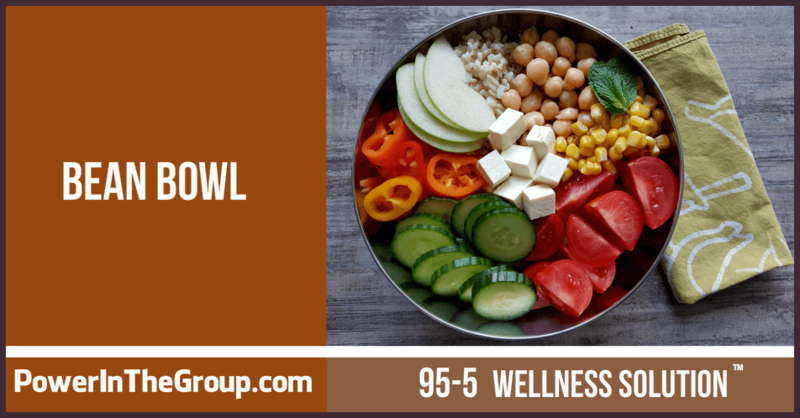 I love making bean bowls for quick meals at home. I also use bean bowls as my go-to solution for lunches when I have to eat on the road or away from home. I love the burst of flavors and all the crunchy vegetables! And don’t make the mistake of thinking you'll ever get tired of beans bowls...after all, your options for ingredients are really endless. Just follow the 7 steps below and you've got hundreds of combinations! 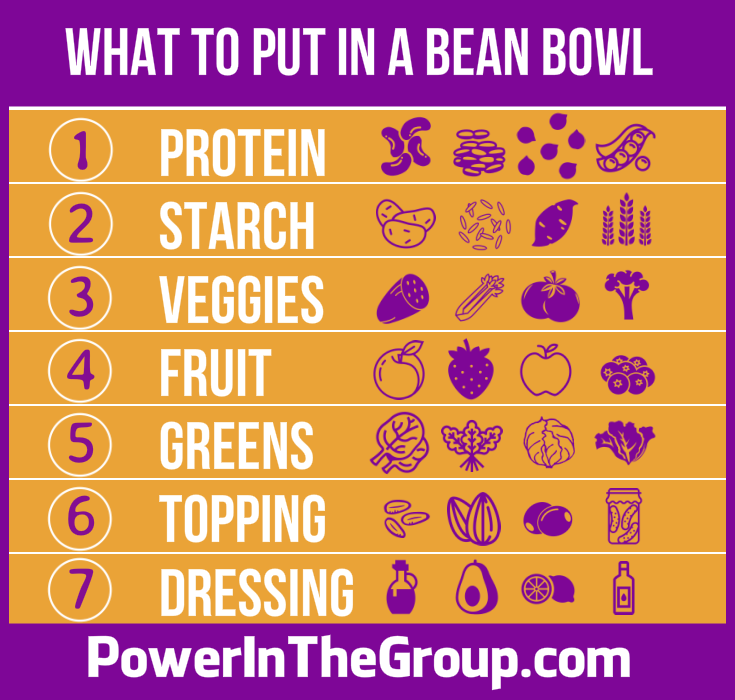 If you've ever had a bean bowl, you know there are tons of stuff in them! Better yet, bean bowls are ridiculously easy to put together! Wanna know my secret to making a super delish bean bowl? Don’t skip the chopped fresh herbs! My favorite herb for a bean bowl is chopped fresh mint. Mint is super high in antioxidants, which help to fight inflammation. Mint's antioxidants are great to have in your diet, because when you have Prediabetes and Insulin Resistance, you've got lots of inflammation in your body. Foods rich in antioxidants will help you heal your body so you can reverse your blood sugar issues. I always add some chopped fresh Italian parsley because that's great for blood sugar control too. 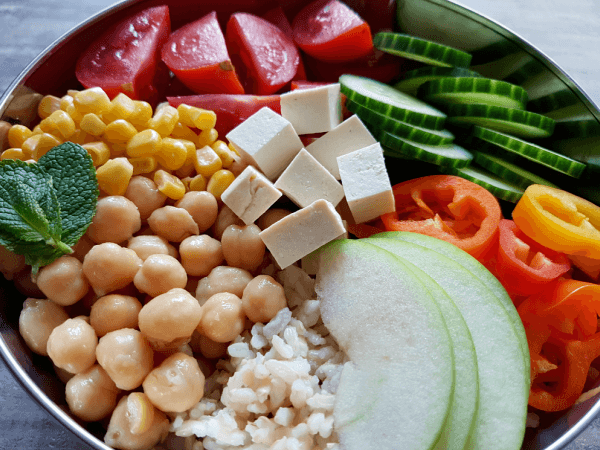 Bean bowls are absolutely the 100% PERFECT pack-and-go work lunch! AND you can make your bean bowls 3 days in advance, so that's over half a work week's lunches! I often pack bean bowls when I go on a car-hike. Bean bowls are my go-to summer-road-trip lunch! Do I Have to Include A Starch? You don't need to be scared of starchy grains or potatoes. Don’t believe the low-carb/keto internet hysteria...it’s not based on long-term science. High fat diets are directly linked with colon cancer and heart disease...and who wants to have a heart attack or end up in the hospital with colon cancer? Whole grains and potatoes are VERY high in resistant starch, ESPECIALLY cold-cooked ones! Resistant starch improves insulin sensitivity, heart function and reduces inflammation. Eating whole grains and potatoes is directly linked with Diabetes Prevention. No one on this planet has ever gotten Diabetes from eating whole grains and whole potatoes! If you skip the starch in your bean bowl, do so at your own hunger peril. You'll get hungry way quicker AND have that feeling like you really didn't eat enough no matter how many beans and veggies you eat. You need that whole grain or other starch to fill you up. Potatoes are VERY good at making you feel full because potatoes are #1 on the satiation index. This means potatoes will fill you up more than any other food! This is why potatoes are a considered a weight-loss food. 5 baby potatoes = only 100 calories! You'd have to eat 100 baby potatoes to reach 2000 calories per day. Click here to learn more about the blood-sugar-control benefits of Whole Grains. Click here to learn more about the blood-sugar-control benefits of Potatoes. Great dressing starts with some good quality olive oil AND some sort of flavor like freshly squeezed lemon, blended berries, balsamic or apple cider vinegar. The general rule is 2:1, oil to juice/crushed berries/vinegar. Is your dressing too tart for you? Then add a teaspoon of real maple syrup, raw honey or coconut sugar. I always use my Dressing Shaker so I can mix my dressing in a jiffy and store any leftovers in the fridge. So now you know how to make a bean bowl. 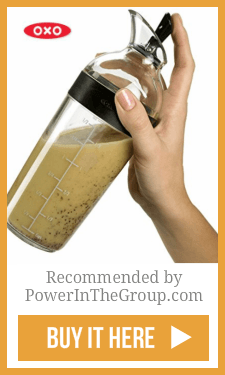 Want to learn more about the blood-sugar-controlling power of beans? You should, because if you want to reverse your Prediabetes and Insulin Resistance, then you should EAT BEANS! Click here for more info. Health benefits of low glycaemic index foods, such as pulses, and diabetic patients and healthy individuals. Legumes improve blood sugar control and reduce cardiovascular risk in diabetics: American College Of Cardiology. Effect of legumes as part of a low glycemic index diet on glycemic control and cardiovascular risk factors in Type 2 Diabetes Mellitus. Cancers associated with high fat diets. Just one high fat meal sets the stage for heart disease.